Back in 2004, a popular arthritis drug called Vioxx was pulled off the market when studies showed daily long-term use could increase the risk of heart attack, stroke and death. “This was one of the most important safety events really in recent medical history,” Dr. Steven Nissen of the Cleveland Clinic, one of the first researchers to link Vioxx to the life-threatening cardiovascular side effects, told CBS News. It also raised concerns about whether another, similar drug — celecoxib, marketed as Celebrex — might have similar risks. But today, Nissen and colleagues reported findings of a major 10-year study which found no such problems with Celebrex, offering reassurance to millions of patients and potentially changing the way doctors approach treating arthritis pain. For the study involving 24,081 heart patients and people at an increased risk for cardiovascular disease, the researchers compared celecoxib with the nonsteroidal anti-inflammatory drugs, or NSAIDs, naproxen (Aleve) and ibuprofen (Motrin or Advil) and found celecoxib no more dangerous to the heart than the two NSAIDs, which have been prescribed for decades. Celebrex was even safer when it came to certain side effects, like serious gastrointestinal problems. The results surprised Nissen and other heart experts involved in the study, he said. “Celebrex is a drug that has a very similar method of action to Vioxx and so the FDA was worried that Celebrex might share the same risk,” said Nissen, chairman of the department of cardiovascular medicine at Cleveland Clinic’s Sydell and Arnold Miller Family Heart & Vascular Institute. There was even some evidence already pointing to it, he added. Given the fact that both Celebrex and Vioxx were taken by millions of Americans, Nissen said the FDA called for a clinical trial to find out whether or not Celebrex shared the same risks that led to the withdrawal of Vioxx. Celebrex is in the same class of medicines as Vioxx, called COX-2 inhibitors. “At the end of the day, we designed the trial to determine whether or not Celebrex had the same risks,” he said. The trial began in 2005 and took place at more than 900 medical centers in 13 countries. “It took 10 years because in order to study these kind of safety issues, you need a lot of patients and we needed almost 1,000 sites around world to participate, and we needed 24,000 patients in order to have enough patients to actually answer the critical scientific questions,” Nissen said. Participants were randomly assigned to receive celecoxib (100 milligrams twice a day), ibuprofen (600 milligrams three times a day), or naproxen (375 milligrams twice a day). On follow-up visits, patients with rheumatoid arthritis could bump up the dose of celecoxib to 200 milligrams twice a day, the dose of ibuprofen to 800 milligrams three times a day, or the dose of naproxen to 500 milligrams twice a day to help with symptoms. For patients with osteoarthritis, increases in the doses of ibuprofen and naproxen, but not Celebrex, were allowed. The patients were treated and followed up anywhere from 20 to 34 months, during which time they were monitored for gastrointestinal and kidney side effects. During the trial, almost 69 percent dropped out; 2.5 percent of the patients died. Nissen suspected there might be a mechanism that would result in Celebrex having at least a modestly higher risk of causing heart disease events compared with ibuprofen and naproxen. His aim was to discover whether or not there was enough of an increased risk to warrant stronger warnings on the pills — or even potentially removing the drug from pharmacy shelves. “I thought that it would probably tilt against Celebrex. That’s what most people in the world thought,” he said, referring to colleagues in cardiovascular medicine. But instead the study confirmed its safety. The difference between the three drugs was not statistically significant but it did trend in a direction that was more favorable for Celebrex, said Nissen. Nissen said it’s important for the public to understand that the researchers weren’t studying the occasional use of these drugs — instead they focused on patients with osteoarthritis or rheumatoid arthritis who take the drugs every day to control pain. “This was a higher dose than what people would take for, say, a headache. It was two to three times as much as people would take for a headache, joint pain or muscle aches,” he explained. One of the reasons Vioxx and Celebrex were developed was to create drugs that wouldn’t be as hard on the digestive system as standard pain relievers, which can lead to ulcers and to bleeding. Nissen said it was “very striking” that when it came to side effects, there was about a 50 percent lower risk of having a serious gastrointestinal complication from Celebrex compared to ibuprofen or naproxen. “It was better on gastrointestinal safety and that does give us choices. It gives physicians the opportunity to give a drug that is safe for the heart and possibly more safe for the stomach,” he said. The drug also had lower rates of kidney side effects compared to ibuprofen. Lavie, who was not involved in the study, said while the new research confirms Celebrex has fewer gastrointestinal and kidney side effects compared with NSAIDs, the real concern that remained was regarding potential heart risks. “Although this large study was not with high-risk patients with advanced heart disease, and there were high drop-outs, still, the cardiac toxicity and survival seemed similar to even slightly better with Celebrex than with the other agents. Certainly, there was nothing negative with Celebrex,” said Lavie, who is also associate editor and cardiovascular section editor of Mayo Clinic Proceedings. There other plusses to Celebrex when it comes to heart patients, Lavie added. 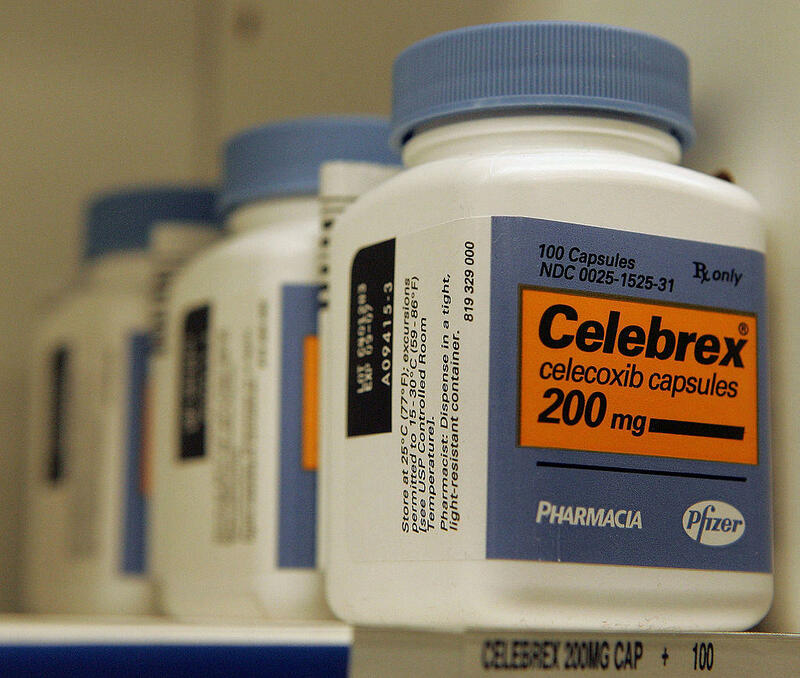 “Celebrex, unlike the other agents, does not have anti-platelet effects so is safer to combine with other blood thinners and can be taken peri-operatively — and even before the operation without increasing bleeding — to reduce post-operative pain, and also does not block the potent anti-platelet effects of aspirin, which is very important for many of my patients,” said Lavie. Doses of Celebrex higher than those used in the study have been shown to cause heart risks in one previous trial, the study authors warned. Nissen also warned against turning to opioids for pain relief. The new findings will likely influence how doctors prescribe arthritis medications to their heart patients, but it may take time before formal guidelines come out, said the study author. The price of the drug has fallen dramatically since generic options became available in 2014, so it’s also an affordable choice. “I do think that physicians are going to now tilt more towards using Celebrex,” Nissan said.